The autumn is my favourite time of year so I love designing fall wedding invitations. 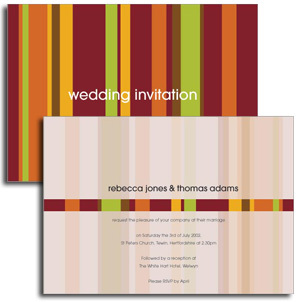 The rich colours, beautiful flowers and all the bounty of the harvest open up a huge variety of images for your unique wedding stationery. If you're planning a Fall/Autumn wedding I hope the following examples might inspire you. Choosing to get married in the fall is a wonderful time of year to celebrate your special day. The cold days have not yet set in and you might be lucky enough to catch some late summer sunshine. Wedding venues are also less busy at this time of year meaning your ideal day and location is more likely to be available. There might even be an opportunity for a bargain by negotiating with your venue for low season prices. The busy summer season makes way for autumn and everything starts to slow down ready for winter. You might even find that more guests are able to join you if you plan your wedding away from the summer/school holidays. Seasonal flowers can be the starting point for your wedding theme. 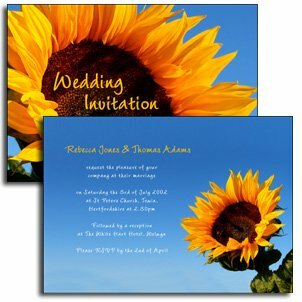 Photographs of sunflowers or gerberas for example make stunning additions to simple flower wedding invitations. Sunflowers are in all their glory at the end of summer/early autumn so include them in your wedding stationery, décor, wedding flowers for an instant colour hit. Sunflowers are particularly cost effective as you don't need many to make an impact. Choose sumptuous reds, burnt oranges, rich browns and opulent gold’s. This simple striped design is understated and elegant. 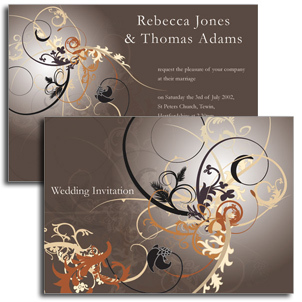 Continue the theme onto all your wedding stationery such as place cards, table plans and thank you cards. 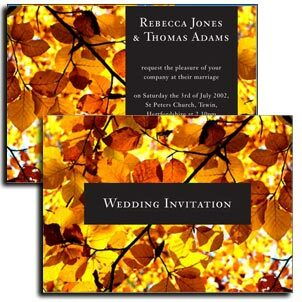 The changing colours of leaves at this time of year can make for some stunning photography which can then be turned into beautiful wedding invitations. Leaves, branches and twigs can also be incorporated into your venue décor. A cost effective way of making a statement without breaking the budget. How about handwriting on dried leaves to use as place cards for your guests. Creative shapes, textures and colours will inspire thoughts of the season and can be adapted to produce matching items for your wedding day. Table plans, place cards, menus etc. can all be designed to create a unity to your wedding stationery. Looking for something unique for your Fall Wedding Invitations? Have a picture of the perfect invitations in your mind that you can't find elsewhere? All of my designs can be adapted to suit your theme. Colours, images, layout and type can all changed to your requirements. I also offer a bespoke design service where I can create personalised stationery from scratch especially for you and your big day. Contact me to discuss your ideas.